By keeping up-to-date with our posts, chances are you’ve been learning about all the amazing initiatives Soul Dancers has been a part of all over the world – specifically in several areas of Colombia. We support a variety of foundations with young men, women and children of all ages with the intent of spreading joy, and bringing hope into their lives through our incredible dance movement. Through the gift of dance and education, we aim to nourish their minds, bodies and souls by providing experiences that build confidence, self-esteem and a sense of happiness. Providing a safe space where these children feel comfortable to express themselves freely is valuable beyond measure. Since Soul Dancers is an amazing dance movement brought to you by Limelight Teamwear, we’re able to work collaboratively by donating items from their collection – such as the Signature Jackets that were donated to the kids of 8T Arts and Villa Danza recently. The H.O.P.E group has also been so kind to donate costumes for the recitals and dance shows the foundations have participated in. There’s nothing like seeing the face of a little girl light up during dance class because she really looks and feels the part! In addition, the children across our various foundations in Medellín, Colombia creatively colour and decorate a specially-made care label that is included with select Limelight Teamwear from their Evolution Collection. Limelight gives $0.20 per custom drawn label directly to the orphanages and foundations Soul Dancers supports, and $2.00 from every Evolution Collection Jacket sold is donated to the Soul Dancers Charity. 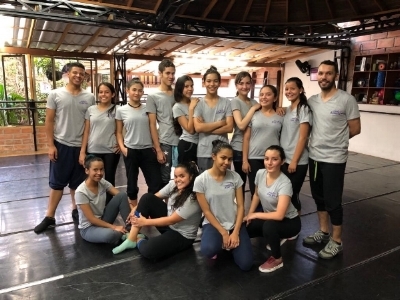 As a result of all the handmade care tags being created, our Soul Dancers group at Villa Danza were able to have team t-shirts made that they can wear during dance classes or even before a show. Here they are pictured below with their new tees! The Soul Dancers Group at Villa Danza has been busy the past few weeks practicing for a show at the Florida Plaza Shopping Mall in Medellin. There are weekly performances held there from different academies across the city, and this past weekend it was their turn to perform and showcase what they’ve learned in class, alongside the other dancers at Villa Danza. The pictures below show the crew dancing a new hip-hop routine they learned and have been practicing– and as you can see from the photos, they did a remarkable job while looking like complete naturals on stage. The response from the crowd was magnetic, and it was easy to see how much they enjoyed the day. When you donate to the Soul Dancers Charity, or purchase an official Soul Dancers clothing item – you are contributing to so much more. Yes dance lessons, yes education, yes healthy meals, but you're also contributing to treasured experiences that these kids will cherish and never forget.